Dream Horse Press, 9781935716181, 94pp. Within the composure of Katherine Soniat's phrasing in A Raft, A Boat, A Bridge something unsettled emerges and will not rest. She presents us with a richly conceived world 'given to see through.' But the seeing is rigorous. These poems are revelatory. -Ron Slate How might one move quietly and slowly enough-crossing water to land or to ether, to high altitudes or low, the strange or the everyday-to give us time to dream what happened on both banks? In A Raft, A Boat, A Bridge, Katherine Soniat's beautifully understated poems sometimes pass through places of great pain, but ultimately beyond them as well. Myth and history, mountains and deserts, grief and intimacy are all transformed in this collection into a poetry of depth, dignity, and richness of language. -Lisa Lewis One kind of lyric is a vertical narrative that demands dense fuel to attain escape velocity. For Katherine Soniat, the heavy metals of the everyday yield a superheated plasma that seem virtually effortlessly extracted (though it is never so): "The astronomers call for marvels, a cosmic shower / in the pre-dawn sky. But this dog won't be energized / by prediction." The epicenter of her poems' orbit is the heart of a long and rich poetic tradition, which means it is also the human heart, and that is just were it ought to be, for Soniat's masterful work reveals again and again that tradition's inexhaustible power. -T.R. Hummer Katherine Soniat is a conjurer. She possesses the third eye-that extra sense-in her astonishing and scintillant fusion of image with concept. Her synesthetic mind fashions images the rest of us must envy. This poet carries her own microscope through which we see a new order: buoyant, surprising, and rare. Her intelligence ranges over a fascinating array of subjects as she reminds us of what true poetry can do. A Raft, A Boat, A Bridge returns us to the choral pavement of its origins. 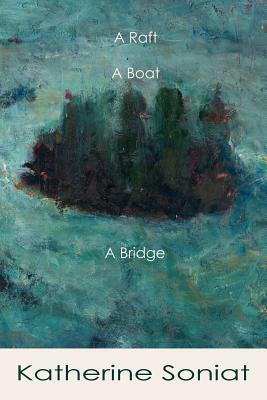 -Tina Barr A Raft, A Boat, A Bridge guides us through and beyond an ever-dissolving world's beauty and brutality. We enter the atmosphere of Katherine Soniat's brilliant, startling, and intimate poems, and we emerge shaken and renewed. -Lee Upton The Swing Girl was selected as Best Collection of 2011 by the Poetry Commission of North Carolina (A.O. Young Award). A Shared Life won the Iowa Poetry Prize given by the University of Iowa Press, and a Virginia Prize for Poetry selected by Mary Oliver. Her fourth collection Alluvial was a finalist for Library of Virginia Center for the Book Award and Notes of Departure won the Camden Poetry Prize, selected by Sonia Sanchez. Soniat has served on the faculty at Hollins University and Virginia Tech. Currently an instructor in the Great Smokies Writers Program at University of North Carolina at Asheville, she lives on a deep ravine with a mother bear and two cubs.